More than 90% of plant dry matter consists of organic compounds such as cellulose, starch, lipids, and proteins. The total dry matter production of plants, the biological yield, is therefore in the first place directly related to photosynthesis, the primary process of synthesis of organic compounds in green plants. In crop plants, however, yield is usually defined by the dry matter production of those plant organs for which particular crops are cultivated and harvested (e.g., grains and tubers). The term economic yield may be used for the harvested crop parts (Barnett and Pearce, 1983). In many crop plants therefore it is not only the total dry matter production that is of importance but also the partitioning of the dry matter. The so-called harvest index represents the proportion of the dry matter present in the harvested parts of the crop in relation to the total dry matter production. The partitioning of photosynthates and the source-sink relationship and its controlling mechanisms are therefore of crucial importance in crop production. In this chapter some principles of photosynthesis are discussed, as are the related processes of photophosphorylation and photorespiration, and examples of the direct involvement of mineral nutrients are given. This discussion includes aspects of photoinhibition and photooxidation and mechanisms protecting the photosynthetic apparatus against this damage. In higher plants the main sites of photosynthesis - the source (mature green leaves) -and the sites of consumption and storage - the sink (roots, shoot apices, seeds, and fruits) - are separated from one another. The long-distance transport of photosynthates in the phloem from source to sink is therefore essential for growth and plant yield. It is, thus, necessary to have a basic understanding of the processes of phloem loading, phloem transport and phloem unloading of photosynthates at the sink sites and the regulation of these processes, particularly in relation to the involvement of phytohor-mones. Finally, the source-sink relationship and the question of whether yield can be limited by source or sink are discussed. 5.1 Photosynthetic electron transport chain with photosystems II and I (PS II; PS I) and photophosphorylation. Q, Quencher; X, unknown compound; Cyt, cytochrome; XAN, xantho-phyll cycle. (Inset) Section of the porphyrin structure of chlorophyll with the central atom magnesium. embedded in thylakoid membranes in a distinct structural arrangement. Often, the thylakoid membranes are stacked into piles (see Fig. 5.4) which appear as grains or 'grana' under the light microscope. The principles involved in the process of electron flow are illustrated in Fig. 5.1. Light energy is absorbed by two pigment systems: photosystem II (PS II) and photosystem I (PS I). In each of these photosystems between 400 and 500 individual chlorophyll molecules and accessory pigments (e.g., carotinoids) act as centers for trapping light energy (photons), with an 'antenna' chlorophyll absorbing at 680 nm (PS II) and 700 nm (PS I). In both photosystems the absorption of light energy induces the emission and uphill transport of electrons against the electrical gradients, from +0.8 to -0.1 in PS II and from +0.46 to -0.44 V in PS I. The electrons required for this process are derived from the photolysis of water, mediated by PS II. In higher plants PS II and PS I act in series (Z scheme; for a review see Walker, 1992). At the end of the uphill transport chain, the electrons are accepted by an unknown compound X and transferred to ferredoxin, the first stable redox compound. Ferre-doxin in its reduced form has a high negative potential (-0.43 V) and is able to reduce NADP+ (nicotinamide adenine dinucleotide phosphate), as well as other compounds (see below). 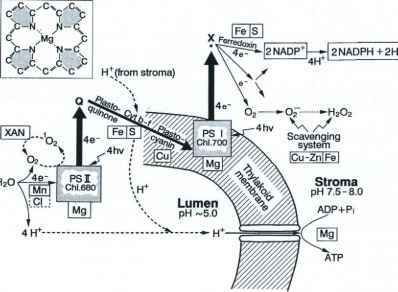 Several mineral nutrients are directly involved in this photosynthetic electron transport chain (Fig. 5.1). In PS II and PS I chlorophyll molecules with their central magnesium atom absorb photons, thereby initiating the electron flow. The photolysis (splitting) of water is mediated by a manganese-containing enzyme complex attached to PS II. In this water-splitting system manganese clusters (Section 9.2.4) act as a device for storing energy prior to the oxidation of two molecules of water. Manganese presumably also acts as the binding site for the water molecules which are oxidized (Rutherford, 1989). Cytochromes (Cyt b-f) with their central iron atom as well as an iron-sulfur complex (Rieske protein) mediate the electron flow between PS II and PS I (Marder and Barber, 1989). One of the electron acceptors in this chain is plastocyanin, a copper-containing protein. Finally, ferredoxin acts as transmitter of electrons from a compound X as yet not well defined to NADP+. This is reduced to NADPH by the ferredoxin-NADP+-oxidoreductase which is anchored on the thylakoid surface. Ferredoxin is a 9 kDa iron-sulfur protein which is soluble in the stroma. Both nitrite and sulfite compete within the chloroplasts with NADP+ for reduction. In leaves the rates of reduction of nitrite and sulfite are much higher during the light period (Chapter 8). This coupling of nitrite and sulfite reduction with light is also an example of a more general regulatory mechanism, since photosynthesis supplies the structures (carbon skeletons) required for the incorporation of reduced nitrogen (—NH2) and sulphur (—SH) into organic compounds such as amino acids. The water-splitting and the passage of electrons through the transport chain in the thylakoid membrane is coupled with the pumping of protons into the thylakoid lumen (Fig. 5.1), leading to acidification to a pH of about 5. On the other hand, protons are consumed at the terminal site of the electron transport chain (formation of NADPH), raising the stroma pH to 7.5-8.0. The corresponding electrochemical potential gradient across the thylakoid membrane is used for proton-driven ATP synthesis, photophos-phorylation. An additional component in the formation of the proton gradient is a pumping system for protons between PS II and PS I (Fig. 5.1), termed 'cyclic photophosphorylation'. The production of one ATP molecule is probably coupled with the downhill transport of three protons across the thylakoid membrane. In the stroma, ATP is required at various steps involved in C02 assimilation, carbohydrate synthesis as well as other ferredoxin-mediated processes (see below). A balance does not necessarily occur between light absorption by the PS II and PS I, corresponding electron flow, formation of reduced ferredoxin, and the consumption of electrons, for example in C02 assimilation. 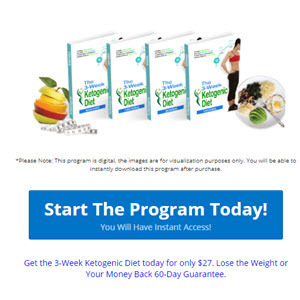 This is true under conditions of high light intensity in general and in combination with other environmental stress factors such as drought, low temperatures, or mineral nutrient deficiency in particular. 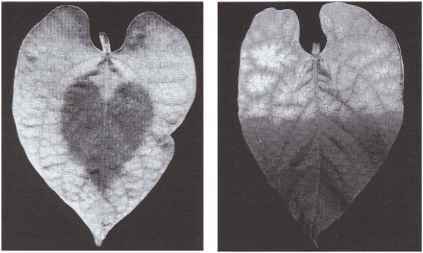 Excess excitation energy is reflected in a depression in net photosynthesis which is usually reversible (photoinhibition), but may also lead in the long term to irreversible damage of the photosynthetic apparatus, as indicated by chlorosis and necrosis of the leaves (photooxidation). For both symptoms the formation of toxic oxygen species is causally involved (Osswald and Elstner, 1986; Salin, 1988; see also Fig. Plants possess a range of protective systems which function by decreasing light absorption or by dissipating energy (e.g., change in leaf angle, light and heat reflection) or detoxification of harmful oxygen species (Fig. 2.5). The primary target for photoinhibition is PS II which produces molecular oxygen and where excessive excitation energy can be transferred from PS II to molecular oxygen forming the highly toxic singlet oxygen ^C^; Fig. 5.1). As a self-protecting mechanism, carote-noids (xanthophylls in particular) play an important role in both scavenging singlet oxygen and quenching the excited stage of PS II (Young, 1991; Demming-Adams and Adams, 1992). Furthermore, in the PS II the 32 kDa Dl-polypeptide has a particularly high turnover rate as required for continuous repair of the system (Walker, 1992). Fig. 5.2 Alternative utilization of photoreductants for C02 assimilation or activation of molecular oxygen and detoxification (scavenger) systems. 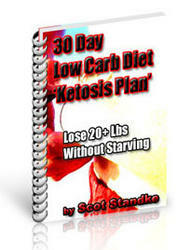 SOD, superoxide dismutase; GR, glutathione reductase; APO, ascorbate peroxidase. lumen as a result of insufficient utilization of ATP in the stroma (Fig. 5.1). Under conditions of limited C02 assimilation a continuous high proportion of the NADPH is utilized for other processes such as scavenging H202 where ATP is not required (Walker, 1992). In C3 species photorespiration may be an important protective mechanism for the maintenance of a high electron flow in the carbon chain, i.e. by releasing C02 to chloroplasts (Wu et al., 1990). Other systems, however, play a key role in detoxifying 02 and related compounds such as H202 (Fig. 2.5). In chloroplasts, where catalase is absent, OJ is detoxified by Cu-Zn superoxide dismutase producing H202 which is reduced to water by the ascorbate peroxidase-glutathione reductase cycle (Fig. 5.2). In leaves about 70-80% of the ascorbate-dependent H202-scavenging enzymes are located in the chloroplasts (Strother, 1988). Elevated activity of the detoxifying enzymes (Fig. 5.2) and increased concentrations of their metabolites (glutathione, ascorbate) typically reflect the influence of oxidative stress, particularly under high light intensity. Such findings have been reported for pine needles during winter (Anderson et al., 1990), spruce needles at noon (Schupp and Rennenberg, 1988), and in bean leaves under magnesium deficiency (Cakmak and Marschner, 1992). There is substantial evidence that toxic oxygen species are also involved in senescence of cells and organs such as leaves (Section 5.5), and that quite often the appearance of chlorosis and necrosis of leaves as visual symptoms of mineral nutrient deficiency is causally related to elevated levels of toxic oxygen species in the leaves. An example of this in bean leaves is shown in Fig. 5.3. Under zinc deficiency the level of toxic oxygen species is high (Cakmak and Marschner, 1988a,b) because of both, depressed SOD activity and lower export rates of carbohydrates as a result of low sink activity (Marschner and Cakmak, 1989). Under magnesium deficiency impaired phloem loading of carbohydrates is the main factor for the oxidative stress under high light intensity (Cakmak and Marschner, 1992). In both instances the production of photooxidants and, thus, photooxidation of leaf pigments, could almost be totally prevented by partial shading of the leaf blades (Fig. 5.3). In agreement with this, inhibited phloem loading of sucrose in genetically manipulated tobacco and tomato plants is also correlated with severe chlorosis and necrosis of the leaf blades (von Schaewen etal., 1990; Dickinson etal., 1991). After carboxylation of RuBP two molecules of the C3 compound phosphoglycerate (PGA) are formed; hence this route of C02 incorporation is referred to as the C3 pathway. The enzyme RuBP carboxylase (Rubisco), which mediates the C02 incorporation, is strongly activated by Mg2"1". In a series of further steps PGA is reduced to glyceraldehyde-3-phosphate (GAP), a reaction using NADPH and ATP supplied from the light reaction of photosynthesis. The principles of C02 fixation by the C3 pathway in chloroplasts are illustrated in Fig. 5.4. The enzymes responsible for C02 fixation and carbohydrate synthesis are located in the stroma of the chloroplasts, whereas NADPH and ATP are supplied from the thylakoids. 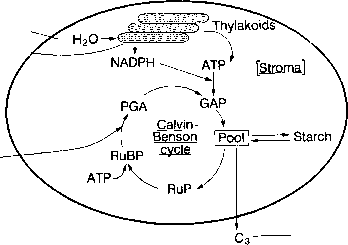 The C02 acceptor RuBP has to be regenerated in the Calvin-Benson cycle. The remaining carbohydrates are either utilized for transient starch formation in the chloroplasts or transferred as C3 compounds through the chloroplast envelope into the cytoplasm for further synthesis of mono- and disaccharides. The rate of release of C3 compounds from the chloroplasts is controlled by the concentration of inorganic phosphate (Pj) in the cytoplasm; Pf therefore has a strong regulatory effect on the ratio of starch accumulation to sugar release from the chloroplasts (Section 8.4.4).